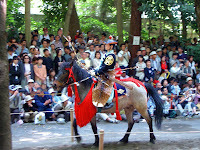 I saw 流鏑馬 (horseback archery) for the first time at 鶴岡八幡宮 (Tsurugaoka Hachiman-Gu) in 鎌倉 (Kamakura, Japan) by pure chance on 18 April 2004, in company of 治子 (Haruko) and François. Local music and modern dances preceded the archery contest, generating a festive atmosphere. Archers were difficult to see as they rode a long alley bordered with trees and spectators but we managed to reach a place where we could see the target and final action.